Grandma Bonnie's Closet has been given the opportunity to review some office supplies from Shoplet.com. 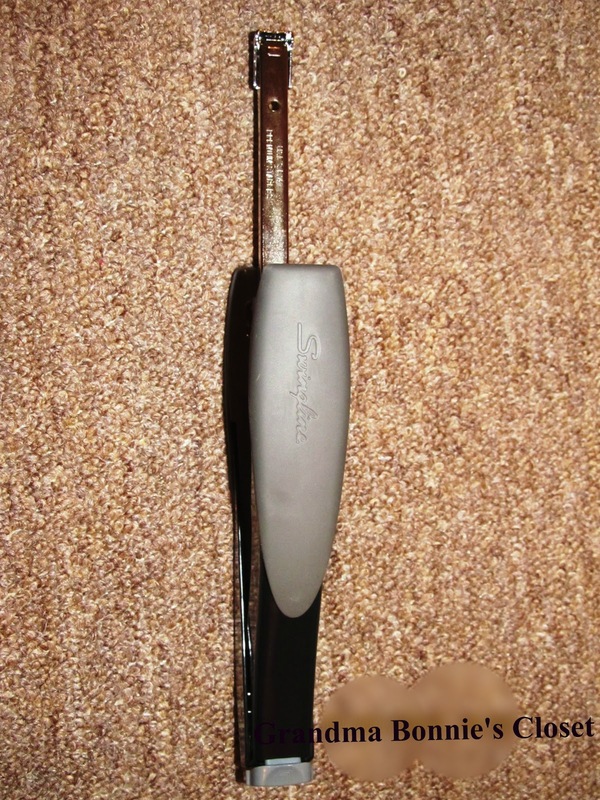 Two of the products are a Swingline SmartTouch Stapler & Swingline Premium Chisel Point Staples. I was very excited to see the Swingline SmartTouch Stapler for the first time. 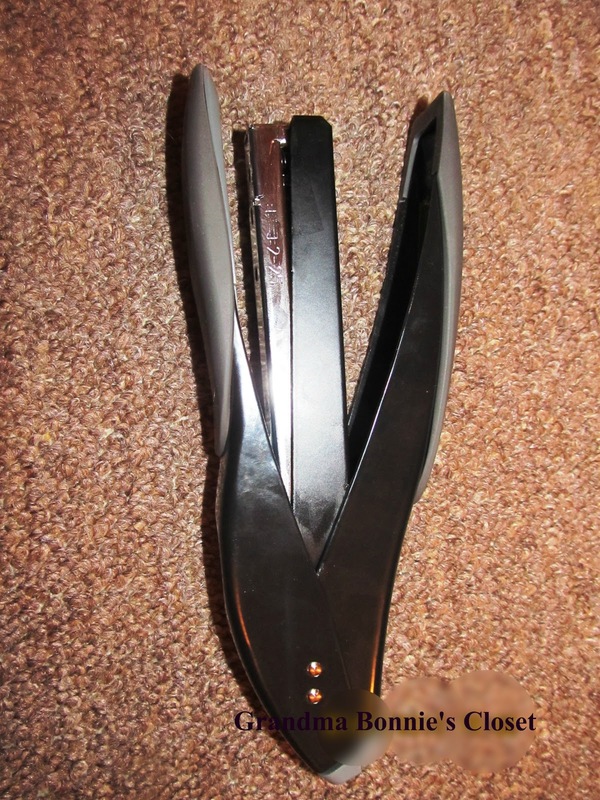 The stapler is shaped ergonomically and comfortable to hold. It has rubber grips on the top and bottom making it easy to hold while stapling many pages. The Swingline SmartTouch Stapler is made to be strong and jam-resistant while only requiring a light touch to staple. This stapler can handle up to 25 pages at a time with very little effort. What did I like most about the product? I really liked how easy it was to load. There is a button at the back of the stapler. Press the button and pull out the tray at the front, load a line of staples in the tray and push the tray in. You are ready to go. With other traditional staplers I have always had a hard time loading staples from the top loaders. I get them loaded and squeeze the stapler shut and always get a jammed staple in the opening. With the Swingline SmartTouch Stapler I have not had a jamming problem. 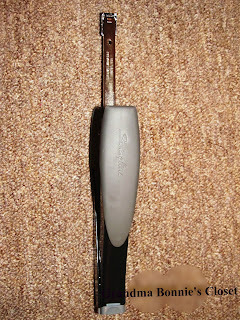 Along with the stapler I am reviewing the Swingline Premium Chisel Point Staples. 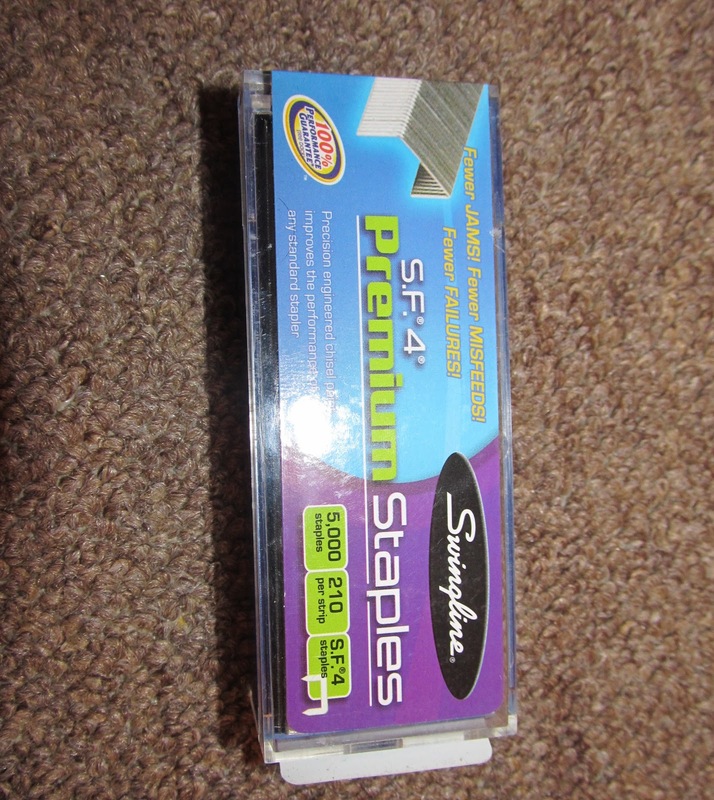 The first thing I noticed different about the staples was the packaging they came in. They are package in a sturdy plastic container that is easy to open. The box contained 5,000 staples with 210 in each strip. When I removed a strip from the container they felt sturdy and did not fall apart while I was loading them. I really like the reusable storage container the Swingline Premium Chisel Point Staples came in. The container is not a cardboard carton that will fall apart in your desk drawer after storing for weeks. Have you ever had to search around in your drawer for loose staples because the staple box fell apart? This container solves that problem! Every time I see a swingline stapler I think of the movie Office Space. "If-If They Take My-My Stapler, I'm Gonna-I'm Gonna Burn The Building Down"
What a great review of these products. Thanks for the review. I like the fact that the staples don't jam when you load them. I love the sleek looking design of this stapler! I also love that the staples are study and didn't fall apart when loading! Great review! Coincidentally I just broke my stapler over the weekend, so I just may check out the Swingline. Thank you for the review. I could use a stapler that doesn't jam. I need a stapler like this. Seems like every time I use mine it doesn't go through the paper. I could use a new stapler, and this looks absolutely fantastic! Love your review! 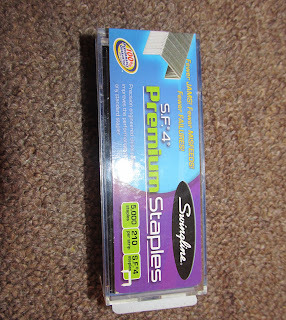 I like that the staples come in a plastic box so that it doesn't fall apart. I also like that it is easy to staple. I love that the stapler is jam resistant. I always hate when my stapler jams up and won't staple. Nice review! Staplers always used to be my enemy at work because they would always jam..we should have bought one of these! Thinking about a good stapler for organization projects. Thanks for the heads up! I hate when staplers jam or clog. Good to know these won't! Thanks for the review. I like the box the staples come in too. You would not believe how many staplers we have gone through in my household! I am def going to have to try this one. TY for letting me know about it! I sure could use one of these on my desk about now ;.) Great review! Love the design of the stapler. Great review! My pet peeve is bruising the heel of my hand when I try to staple a thick stack. Ouch! This one looks pretty good. Thanks for the review. Great review. I'm going to check out their website. I really need a stapler for home to keep things more organized. Thanks for the review! I love that this stapler can handle 25 pages at once. And that's a unique way to load the staples, but it's great. Can't believe it wasn't thought of sooner. Thanks for the review! Love that it can handle 25 pages at a time. Mine at work can barely handle 10. Great and useful product according to this wonderful review! Thanks! Thanks for this great review, this looks like a wonderful product! I could use one with all the stapling I need to do! This review is very helpful. The reviewer covered all of the major features of the new stapler. It is especially important to me that I can staple together up to 25 pages at a time! Thanks. I love Swingline. They make the best staplers ever. They hardly ever jam. Thanks for the review. I like that the stapler doesn't jam, as that has to be my pet peeve when working with staples! It looks like it would be easier on the old arthritic hands! Great review! Looks like a fantastic product! that's something i don't have...a stapler! could actually use one! A stapler is one of those items not needed until something needs to be organized and in one piece to go to the boss. I always have that problem of jammed staples too! This looks like a great stapler to try to fix that problem. I for one hate finding staples on the floor , especially on bare feet! ouch!!! Yep gotta try this stapler! This is a nice one, I could really use one of these, thanks for the review. i would never use anything but a swingline. this staple would be perfect in my classroom! I dislike topload staplers too! A backload stapler will always be my preference and it can handle 25 pages! ...impressive! "If...if they take my...my Stapler, I'm gonna...I'm gonna burn the building down!" Thanks for the review! Jamming staplers are definitely annoying and a waste of time! With the stapler that I have it is difficult to staple numerous pages. I like that it will staple up to 25 pages. Thank you for the review! This look like a great stapler and so sleek! The stapler review answered some of my concerns about a good stapler that doesnt jam and staples multiple pages at a time. Thx for posting the review. I loved this review. I might snag me one of these puppies! Thanks! I think we could really use that stapler at my house about now! Thanks for the great review. That is one fancy looking stapler! I like that it's "jam-resistant." It's really frustrating when staplers jam! I have this exact stapler and I love it!! Great review! would love a stapler that doesn't jam..
That stapler looks awesome. It would make my coupon clipping so much faster. The review on this stapler was fantastic. I'd want to go out and buy one. These sound great - I wonder (hope) that they'll work in an electric stapler, which is what I use at work and which loves to get jammed up! 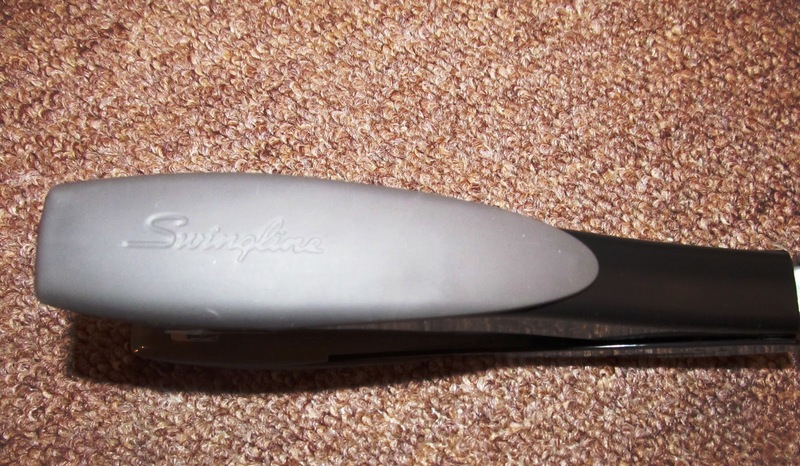 Great review, I've always liked the Swingline brand staplers. I'm like a few of your readers puts me in the mind of office space. LOOKS LIKE LIKE A NEED TO GET ONE OF THESE! THANKS FOR THE REVIEW. This stapler sounds like just what I need. I love that it can handle up to 25 pages at a time with very little effort and that it doesn't jam. Thank you for the great review! I can always use a new stapler and swingline is top of the line. Our receptionist at work has this stapler and I love it! Great review! It looks like a very good stapler. That is a very stylish shape to this new stapler. Very nice product and review. A storage container for the staples?!!! That is awesome! Thanks for the review. I like the easy to grip padding on both sides and the ergonomic design. Thank you for the review. A stapler that works! Awesome! The one good thing is, that even though technology has changed the way we do things, staplers have stayed the same, and are still very useful, whether at work, home, school, or just about anywhere. It's good to see even basic items get updated and made easier. Oh my gosh, this stapler looks fantastic! It would definitely come in handy when sorting and stapling all my coupons! I love Swingline products, thanks for the review!! Swingline staplers are a "favorite" of mine! up to 25 pages, that is so awesome!!! Wow - just have to say YOU are an awesome product reviewer to be able to review a stapler so thoroughly! I would have said, "well.. it .. you know.. .staples things together!" LOL Seriously - great post! Great review! Interesting to know that the stapler comes with 5000 staples. Great Review! I hate when the stapler box breaks down. This looks like a great stapler. I haven't used a stapler in forever! And I always had the problem of the staple getting all stuck after I punched it down. But here shortly I'm going to have to get some office supplies (starting back school) and a stapler will be on my list. I'm going to check this one out! I used to work in an optometrist office with paper charts for patients. Swingline staplers were a must for stapling through patient records. We have some that went between the 1960s-2011! Swingline staplers are the only staplers that we use. Great product! This stapler seems to offer more "comfort" when stapling. Gonna have to get me a one of these staplers just so I can have the staples that are not in a cardboard box. I am still getting individual staples out of my file cabinet. 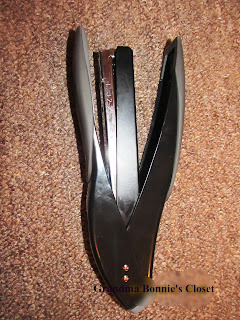 I have been in need of a new and sturdy stapler since i have been using a dollar brand for so long and it always messes up the staples or can't go throw more than a few sheets of paper ...I wil have to give this one a try - thanks for the review! Thanks for the review. Seems like a really great stapler. I have an old one that is a pain to load. Great review. I like how you can staple so many pappers together and easy loading staples. i love office supplies. cool stapler! @SocialStudiesSoubrette but it's not red! lol Actually I thought of the same thing hahaha. I have used swingline staplers every since I was about 16 or so when I bought my first and last one, I still have it and I am 50 they simply are the best! I wonder if that model stapler comes in red. The stapler would come in real handy at work because they make us use cheap ones that jam. Thanks for the review. I need a good compact stapler.